Bangers and Mash with Onion Gravy, a true British classic that pretty much sums up what comfort food is all about. Enjoyed throughout the year, but even more on Bonfire Night, this recipe is truly amazing! If you wonder what bangers actually means, they are actually sausages. 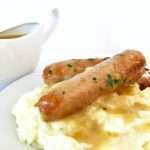 Where does this Bangers and Mash recipe come from? The term bangers is said to come from the bang noise the sausages made when fried in a pan. And all the popping came from the fact that during WW2, with food rationing in place, sausages used to have a high water content so that the amount of meat used was actually quite low. An interesting story anyway. If true or not, it really makes no difference. Bangers and mash are still a family favourite. 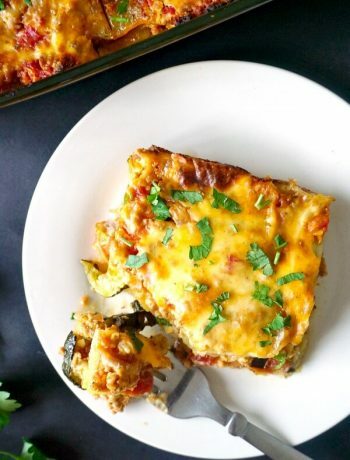 Some dishes are too good not to be enjoyed by many generations. I’ve always loved mashed potatoes, it has actually been my birthday meal together with steak for as long as l remember. And l’ve always been more excited about it than about my birthday cake. Now, you can imagine my shock that my little one seems to find mash yucky and simply won’t eat it. I’m speachless!!! I have never thought it was possible for a child to dislike it. I mean, come on! Oh well, l’ll gladly eat her portion too!!! So, if you agree with me that there is no better meal than some delicious sausages in onion gravy, you have to try this recipe. The sweet taste of the onion gravy goes so wonderfully well here. I simply can’t think of a better sauce to have the bangers and mash with. But, of course, it’s all up to one’s taste. If you are not very familiar with gravy, I must add it’s the best sauce you can ever get for your food. It goes wonderfully well with any meat, and it has its own special place on a Sunday Roast. Forget about ketchup, this onion gravy is the only recipe you need for sausages and mashed potatoes. You can use any kind of sausages, even vegetarian or quorn sausages. And the mash, oh my! The creamiest, silkiest and tastiest mashed potatoes ever! You really have to give it a go! 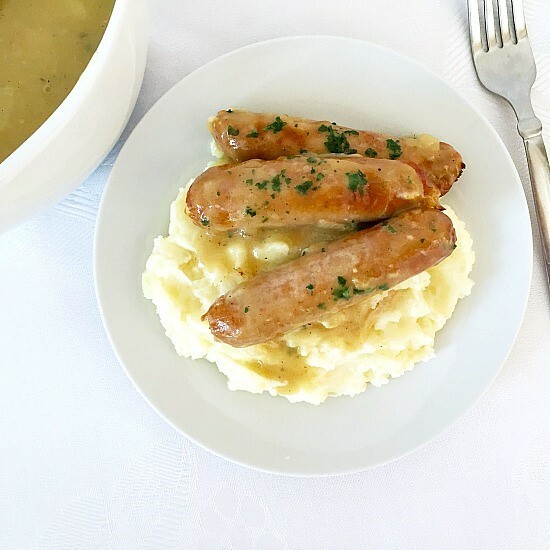 If you’ve liked this BANGERS AND MASH RECIPE or any other recipe on the blog, then don’t forget to rate the recipe and let me know how you got on in the comments below, I love hearing from you! You can also FOLLOW ME on FACEBOOK, and PINTEREST to see more delicious food and what I’m getting up to. Bangers & Mash with Onion Gravy, a true British classic. Enjoyed throught the year, and even more on Bonfire Night, this recipe is sheer pleasure. To make the mash, boil the potatoes in their skin and add a pinch of salt to the water. When tender, drain the water, allow them to cool a bit, then peel and mash. I don't like using a hand blender, l think the potato masher is actually the best at this job. Add the butter, milk and salt, mix well and set aside. Line the sausages on a baking tray, drizzle with oil and bake for about 20 minutes until golden brown. Different sausages will have different fat content, so you might like to add less oil. Also, feel free to fry the sausages if you wish. To make the onion gravy, peel and cut the onion roughly, add oil to a sauce pan, and geat it up. Add the onion, salt and sugar, and fry on a low to medium heat until the onion is golden. Mix in the flour, give it a good stir, then and the stock and whisk well. If you use beef or chicken stock, the gravy will have a much darker colour. Leave to boil until the gravy is thick and the liquid has reduced by a quarter. Arrange the sausages and mash on a plate and serve with the onion gravy. 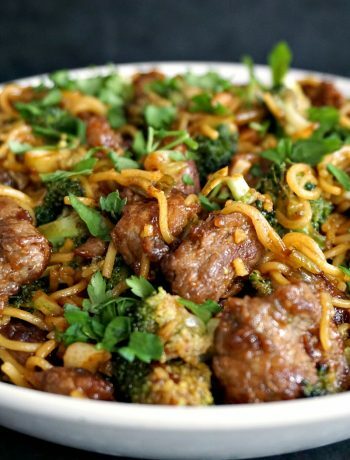 You can use any kind of sausages, pork, turkey, chicken, or even vegetarian or vegan.